This might look like a strange microscopic image, or even an aerial view of a sprawling city late at night—but in fact it's what a 600-billion-billion-kilometre-wide section of the universe looks like. Modelled by a team of scientists at the Baryon Oscillation Spectroscopic Survey, the image shows the light thrown out of quasars as it propagates through our universe. These astronomical bodies, powered by black holes, emit light which is twisted and warped as it passes through galaxies and gas clouds. 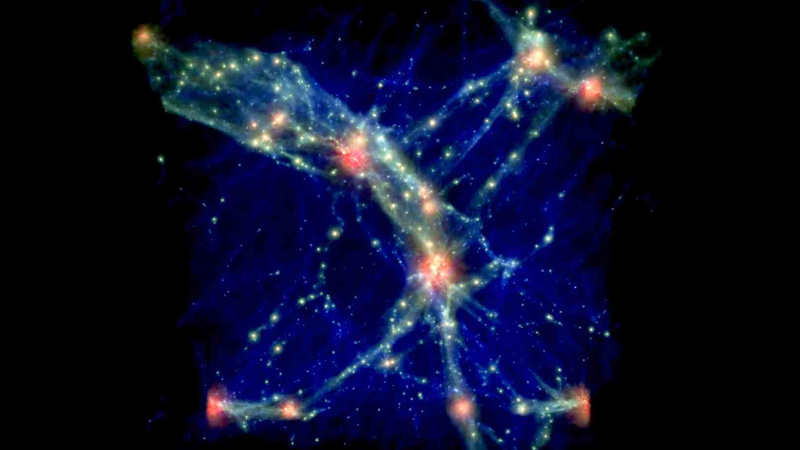 The red patches are galaxies, the blue strands gas clouds.